To an outside observer, the building process might seem segmented with planning, architecture, engineering and consulting firms all providing necessary aspects to the finished project. Allen & Hoshall tries to simplify the process with its comprehensive offering of all those services and more. Whether it’s mechanical or plumbing engineering for a building project or wastewater system engineering for a utility project, land surveying or construction management, Allen & Hoshall covers the gamut. The Memphis-based design firm began in 1915 and today has a staff of more than 100 professionals working out of offices in Memphis, Nashville, Chattanooga and Knoxville, Tenn., and Jackson, Miss. Harry Pratt has experienced many of the ups and downs at the company. A civil engineer, he has been with Allen & Hoshall for 41 years. He was elected president of the employee-owned company in late 2015. Pratt, like many of an earlier generation of engineering and architecture professionals, was trained to think in two dimensions. Now, he said, they draw and present in 3-D and even sometimes in virtual reality. Pratt said those technological advances are reshaping how the industry operates. As more 3-D screens are introduced into personal and professional settings, taking advantage of the software has been an important way for the firm to evolve. Being a full-service firm has helped bring key components of projects together. As architects take ideas and draw them out, engineers begin putting up skeletons of a project as electrical engineers hang lights. All of these disciplines are trying to fit in the same space around each other at the same time. And technology is there to help these various disciplines communicate to make the project come together. Allen & Hoshall has worked with a wide range of clients. From federal down to state and local offices, the firm has worked with government entities for decades. The firm’s handiwork touches a variety of projects around Memphis and Shelby County including FedEx Corp., the new Chisca Hotel redevelopment on Main Street downtown, education facilities and health care properties, such as Methodist University Hospital. When Pratt joined the firm in 1975 there was one office located in Midtown Memphis. Within three months a regional office opened in Jackson, Miss. Offices have come and gone in places such as Tunica and Hernando. Allen & Hoshall has weathered storms in its 100 years, including the 2008 recession that crippled the real estate and construction industries. Pratt said the firm wasn’t “bloated,” but it was larger than it is today. 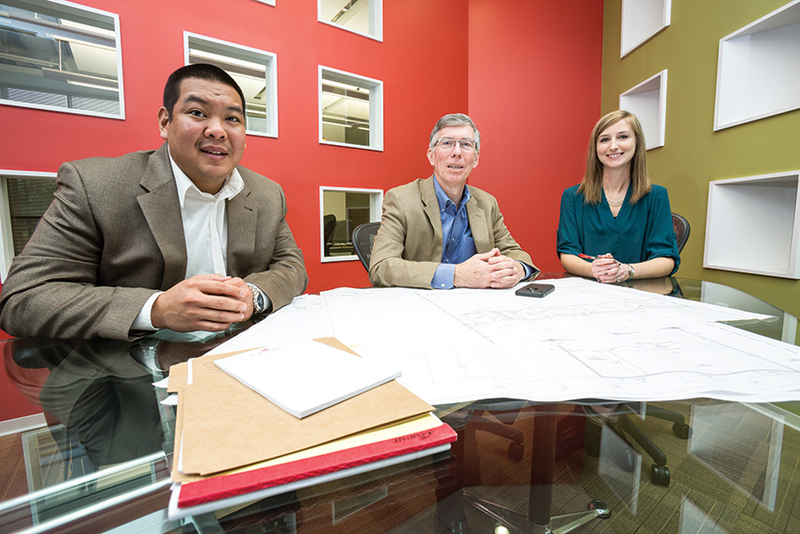 Selective and strategic downsizing helped streamline the firm. Business in Memphis continues to ramp up, but it’s not quite to the point of the construction boom the firm is a part of in Nashville. But there are projects in this market, including a new career technology center in DeSoto County and the Main-to-Main project that should be completed this year. Pratt said the firm is especially proud of the legacy projects it has played a role in through the years, including what he said are most of the major landmark buildings in Downtown Memphis. Looking to the future, Pratt said the firm’s leadership wants to expand its architectural services. He also said the aviation market, particularly with the design and construction of hangers, has real potential for future growth. Of course the firm already has left a major footprint on the Memphis landscape in aviation, and it can be seen and heard approaching Memphis International Airport beginning about 11 nightly. The firm has worked with the Memphis-Shelby County Airport Authority for decades, including the creation of the parallel runways in the 1980s and the World Runway that sees the massive FedEx jets heading off to Asia and Europe nightly.